Grayce Liu is the General Manager for the City of Los Angeles Department of Neighborhood Empowerment, which supports Los Angeles' 97 Neighborhood Councils in meeting their mission to increase civic participation and making government more responsive to local needs via the EmpowerLA movement. Neighborhood Councils are comprised of nearly 1800 unpaid elected officials who live, work, own property or have a substantial and ongoing community interest in a neighborhood and who advise on the City budget and delivery of City services. The Neighborhood Council system is the largest grass roots civic engagement and public participation system in the nation. Grayce started with the department as field support in 2007 and was appointed to the General Manager position by Mayor Antonio Villaraigosa in 2012 and reappointed by Mayor Eric Garcetti in 2014. She is responsible for the overall management of the department, including development of the budget, strategic planning, programs and services, policies, personnel and constituent and City government relations. In addition, Grayce works to streamline City processes for Neighborhood Councils to better interact with the City Hall. 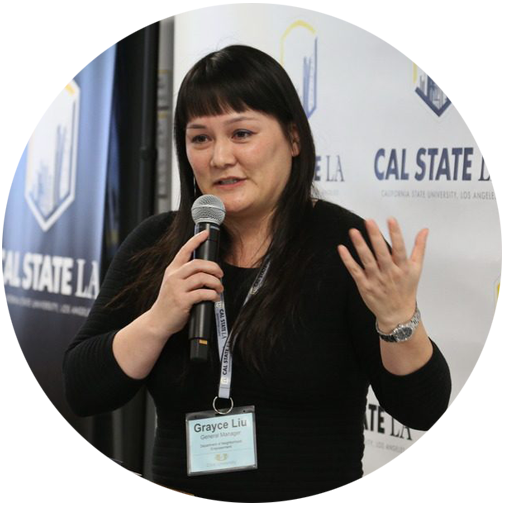 Prior to working with the City, Grayce was the Community Program Director for the Center for the Pacific Asian Family (CPAF) and the co-chair of the Asian and Pacific Islander Domestic Violence Task Force in the San Gabriel Valley. She now serves on the Burbank Planning Board and continues to teach classes on domestic violence, sexual assault, compassionate communicate and self-defense in her free time.